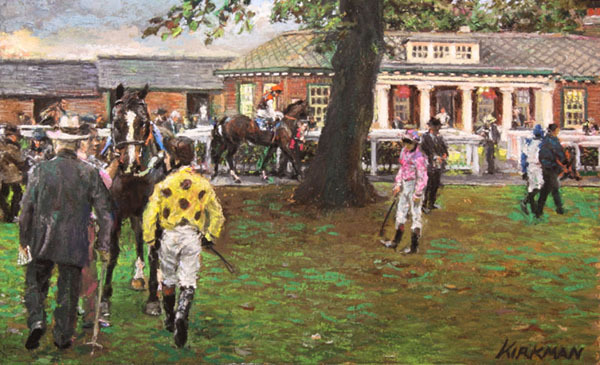 Original pastel paintings and drawings of racing subjects by the American-born artist, now resident in the UK, whose work has been described as described by one art critic as "the marriage of Stubbs to Munnings". Jay Boyd Kirkman was born in Los Angeles, California, in 1958, and has been resident in England since 1973. He studied at the West Surrey College of Art and at the Camberwell School of Art from 1976-1980. He has been working in the equestrian genre since 1980, finding in this a rich and dynamic source of inspiration which allows a wide variety of approach and experimentation. 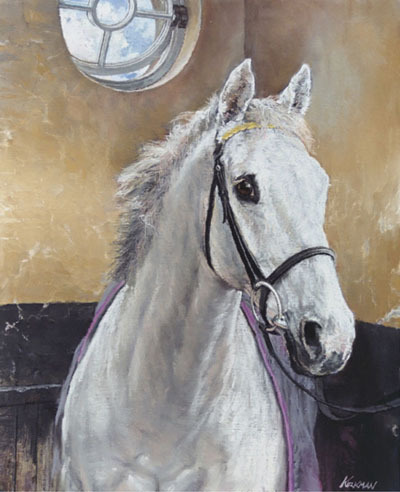 His pictures range from characteristic racing scenes in the long tradition of British Sporting Art to paintings which focus upon the horse in the manner of a psychological study. His work evokes the atmosphere of racing, whether portraying scenes on the course or concentrating upon those private periods of preparation away from the public gaze. Inspired by the historical depiction of the relationship between horse and man as found in the works of Degas and Gericault, his immaculate renditions of the daily aspects of the racing world have been described by one art critic as the marrying "of Stubbs to Munnings". Jay Kirkman has exhibited his paintings regularly since 1983, particularly in London and Dublin, at both prestigious art galleries and major art fairs. His subjects have also been included in many specialist magazines and his work now forms a part of important private collections both in Britain and abroad. All images in this section are copyright the Artist. No reproduction without permission.